Grand Prix weekend may be over, but with few major Modern events between now and the next GP bonanza, players will need to look to Charlotte and Los Angeles for the most recent Modern home-runs. And what a weekend of home-runs we got to enjoy! Between Jeskai Control solidifying Tier 1 status, Affinity making its inevitable comeback after a stint in hiding, and my beloved Ad Nauseam sailing to the Charlotte gold, there was a Modern slam dunk for everyone. Even those Eldrazi expatriates got to bring the CRUNCH back to coverage and top tables. With more success stories than a self-help book infomercial, we’ll have plenty of innovations to experiment with until August. Our monthly metagame update is scheduled for next Wednesday, and if current trends hold, we’re on track for the most diverse period of Modern since last summer. Today, we’ll trade our bird’s eye view of the format for a magnifying glass. When most Moderners think of “technology,” they often picture new cards, stunning sleepers, and breakout bombs the world has never seen. It’s an exciting portrait, but a rarer one than we think. As we saw at both Grand Prix, most technology takes the form of cards we already know getting reapplied in new contexts, or in seemingly minute decisions about ratios and splits. We’ll be examining two top-tier case studies of this micro-technology approach, unpacking card choices to educate players or opponents of these decks, and to illustrate some principles about making smart innovations for your own strategies. I know what you’re thinking: “since when does the venerable Lightning Bolt qualify as new technology?” In a format where technological achievement is often awarded to splashy powerhouses like Nahiri, the Harbinger or format-shattering monsters like all things Eldrazi Winter, Bolt feels like a letdown. That is, unless you’re Joe Lossett piloting RG Tron to a 5th place finish at GP Los Angeles and you’ve traded all your maindeck Pyroclasms or Firespouts for the hallmark instant. If you’re Joe Lossett, that playset of maindeck Bolts probably feels like taking an old deck to a whole new level. From a slot perspective, Lossett has made a key decision which makes the Bolt technology such an intriguing discussion point: he’s negotiated a sweeper slot which previously felt non-negotiable. In a sample of about 50 RG Tron decks played between May 1 and today, literally 0% lacked some combination of Pyroclasm, Kozilek’s Return, and/or Firespout in the maindeck. Similarly, 0% had maindeck Bolt. A cursory review of most Tron literature also emphasizes the importance of these cards, and few prospective Urzatron assemblers leave home without them. I mention this context because I can already hear the RG Tron pioneer who claims he’s been using maindeck Bolt for years. Maybe you have, but even so, you’re in a private minority. For the majority, conventional Tron wisdom demanded sweepers in those 2-4 slots. Even Lossett followed this imperative two weeks earlier at SCG Milwaukee, taking 2nd with 3 Firespouts main and Bolts shunted to the board. Of course, none of this is to say Tron has never considered maindeck Bolt. Indeed, an RG Tron player named Johannes Wagner ran 4 Bolts at the end of March to a Top 8 finish in Germany. It’s just incredibly uncommon from a metagame perspective. What changed for Lossett at Los Angeles? Looking over pre-GP numbers and considering Tron’s matchups, you can practically see the crispy Noble Hierarchs and Blighted Agents in Lossett’s crosshairs. Infect was the third most-played deck going into the Grand Prix, surpassing both historic top-dig Affinity in the aggro department and edging out Tron itself. Infect vs. Tron isn’t quite as calamitous as Infect vs. Ad Nauseam, but it can feel very much like Tron vs. Jund from the Tarmogoyf side of the table. It’s a Game 1 massacre that only improves marginally in Games 2 and 3, but Bolt goes a long way towards repairing this broken contest. The maindecked Spellskites further point to Infect being one of Lossett’s major considerations. On top of Infect, Bolt also handles the Burn decks which could push through a Pyroclasm-proof Wild Nacatl, not to mention the other x/3-or-better maulers in Gruul Zoo strategies. It might not clear Affinity’s Signal Pest and Ornithopter swarm, but Bolt does stop Inkmoth Nexus and Arcbound Ravager lines where a sorcery-speed sweeper is helpless. It’s true that Bolt can be ineffective against strategies like Elves and Merfolk, where blasting individual creatures is less effective than firing up the entire field. That said, Bolt has enough applications against swarm strategies (crisping a Lord or nuking a key Heritage Druid) to ensure it isn’t totally useless. Besides, if it improves the Infect showdown, that’s a percentage point trade most Tron mages would take. Add the surprise factor against hapless opponents not expecting instant-speed interaction and it’s not hard to see how Lossett’s clever substitution and metagaming earned him a spot in the Top 8. Lossett’s preference for spot removal over sweepers illustrates one of the most important lessons in selecting new technology: have a specific goal in mind. Tron is notoriously soft to fast Infect starts. Bolt is notoriously effective at slowing and outright stopping those starts. As a Tron player, if your goal is to improve a bad and common matchup, then Bolt is where you want to be. This is in contrast to another approach where cool technology is applied in a context vacuum, like trying to get the Lightning-rod Tireless Tracker to work in Goodstuf.dec Jund. Going forward, I expect we’ll see more Tron players opting for the Bolt playset over the sweeper suite, and not just because they’re netdecking Lossett’s list. Bolt is a sharp metagame call if you expect high levels of Infect and aren’t worried about too many “go-wide” strategies in Elves, Gruul Zoo, and others. Tron opponents will need to be wise to this play, especially if you are packing mana dorks or other Boltable targets. There was a time in Modern when Liliana of the Veil was the only planeswalker in town. No, your sideboarded Jace, Architect of Though singleton doesn’t count. In those days, Modern’s preeminent policeman, Jund and BGx Midrange generally, could get by with Bolt, a quick zap from Kolaghan’s Command with beatdown backup, and the almighty catchall Abrupt Decay. Sure, you were still dead in the water to Modern’s other competitive planeswalker, Karn Liberated, but Tron was already a matchup that demanded far more than just more effective walker slayers. Then came Nahiri, the Harbinger and BGx had a real problem. To be sure, Jeskai Nahiri doesn’t represent quite the same challenge to BGx as Tron, but its namesake planeswalker is the exact kind of durable, decisive, and popular threat which causes Jund pilots trouble. Inquisition of Kozilek can’t nab her from the hand. Decay can’t snipe her off the board. Nahiri’s +2 takes her out of Tarmogoyf, Tasigur, and Raging Ravine range alike, and her -2 quickly removes any active, non-Ravine threat on Jund’s field. Needless to say, “Suspend 2: fetch Emrakul, the Aeons Torn” is lights out for a deck relying on Terminate for opposing big bads. With Jeskai Control up to 5.5%-6% (still settling based on data added every day), format king Jund has already done what Jund does best: adapt and evolve. Team Jund representatives Mike Sigrist and Adonnys Medrano tweaked their core 60 to combat opposing Nahiris, and with both players finishing in the Charlotte Top 8, it’s clear they had the right idea. How did they solve the Nahiri dilemma without diluting the goodstuff pile? Medrano with Dreadbore and Sigrist with +1 Maelstrom Pulse. Both Medrano and Sigrist dedicated two maindeck slots to combating Nahiri, sharing a Pulse before splitting on Dreadbore #1 vs. Pulse #2. We’ll start our comparison with Dreadbore because it’s the flashier and techier of the two routes. Doubling your Pulse count feels even less exciting than adding Bolt to Tron. Importing an effectively unplayed rare into Modern feels like innovation at its most successful. It’s easy to see where Medrano was going with including the former Standard standout in his Jund list. Mana-efficiency is huge in Modern, with the difference between two and three mana separating the Counterspells from the Cancels. Although not an instant, two-drop Dreadbore is an on-curve answer to almost all fair creatures in Modern (opposing Tarmogoyfs, the delve creatures, Eidolon of the Great Revel, etc. 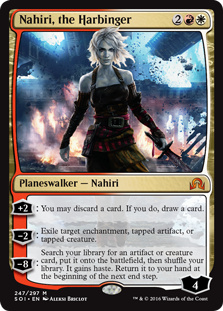 ), doubling as the cheapest way to one-shot an active Nahiri in the format. Whether nuking Nahiris or doing a passable imitation of Terminate #5, Dreadbore appears an elegant way to manage Jeskai’s rising presence without compromising Jund’s gameplan elsewhere. Sigrist, who reflected on his Grand Prix performance in an SCG premium article last week, went a different route, staying true to the Jund core by upping his Pulse count. Dreadbore didn’t even make the sideboard cut! Like Dreadbore, Pulse nukes Nahiri while also blowing up a wide range of opposing creatures. Unlike Dreadbore, Pulse costs three instead of two, ostensibly making it a much worse option in “mana matters” Modern. Dreadboring a two-drop at least answers a threat at parity. The red-black sorcery also gives you the option of Bolting Boring the Bird if you’re on the play against a turn one dork. But Pulse? You’ll almost never Pulse the Parrot (or whatever avian species is depicted on Birds of Paradise), and with so few three-drops played in Modern, you’re also unlikely to kill creatures at parity. Given these seemingly steep drawbacks, why does Sigrist take the haymaker over the bullet? Thinking contextually, I’m seeing a few distinct advantages to a second Pulse over a first Dreadbore. For one, Pulse is an actual catchall which answers a wide range of devastating Modern threats. This includes popular trumps like Ensnaring Bridge, Cranial Plating, Blood Moon, and Prismatic Omen, as well as more obscure roleplayers such as Ghostly Prison, Pyromancer Ascension, and Phyrexian Unlife. Jeskai may have jumped by 2%-3% in the past month, but all those decks demanding effective catchall solutions comprise well over 2%-3% of the format. Unless you’re expecting disproportionate Jeskai Nahiri levels, Pulse is the more versatile bet. In addition to this flexibility, Pulse doesn’t crumble to the widely-played Spell Snare (a frequent one- or two-of inclusion in Jeskai’s countermagic suite), and can sometimes compensate for those three mana symbols in the upper right by virtually sweeping a committed opponent. Pulse is no Pyroclasm, but it sure feels good to take out a Burning-Tree Emissary pair after Bolting the lone Nacatl. All of these edges combine to give Pulse a slight advantage over Dreadbore in my books. Of course, it doesn’t have to be a question of Dreadbore or Pulse. Why not Dreadbore and Pulse instead! As Sigrist discussed in his article, he almost ditched the fourth Terminate for the additional Dreadbore, a deckbuilding decision shared by Reid Duke who also talked post-Nahiri Jund leading up to the Grand Prix weekend. In fact, Duke was down to just a single Terminate, trading one for Dreadbore, another for Slaughter Pact, and a third for the flex Seal of Fire or Kolaghan’s Command #2 slot. Those are all options, but I’d shy away from Seal or Pact if I wasn’t also packing Kalitas. Sigrist cautioned against this 2 Pulse, 1 Dreadbore line, warning that sorcery-speed Dreadbore is not interchangeable with Terminate when facing down manlands, a notable worry if you have Infect’s Inkmoths and Jeskai’s Colonnades on the mind. I echo Sigrist’s fears and also point to Jund’s existing curve as additional reason to avoid Dreadbore. BGx Midrange is historically bloated in the one-mana and two-mana slots. Three-mana, however, is typically empty outside of Liliana and the occasional Kitchen Finks, which creates a slick opening for the Pulse bomb. Jund loves to be efficient with its mana, and although Dreadbore with Bolt backup feels nice on turn three too, committing to Pulse is going to feel better in most case. Especially when you’re nuking random artifacts and enchantments Dreadbore can’t touch! Overall, the Dreadbore vs. Pulse question points to the importance of tiny innovations in compact spaces. Adjusting even just a single card can make a massive difference in your matchups and gameplay. Moreover, as this particular comparison illustrates, that extra card doesn’t even need to be some splashy technology no one has ever seen. Sometimes you just need to increase the count of an already powerful staple to fix your problems. As someone whose been experimenting with a singleton Mystical Teachings in their Ad Nauseam maindeck, I can appreciate the important of small adjustments to make major improvements. RG Tron and Jund are two of Modern’s most-played and least-modified strategies around. If these little refinements can play out in such established cores, imagine what similar corrections can do in lower-tier decks with more room for evolution. I’m excited to see these kinds of changes play out over the summer; it’s the kind of deck growth we expect in non-rotating formats. Thanks for joining me today on our technological deep-dive. I’ll be back next week with our darling data tables and a metagame description to kick off the summer. What technology are you working on as we head into June? Any Tier 1 or Tier 2 decks you feel are prime for small shifts to get them to the next level? Let me know in the comments and I’ll see you all soon! Dreadbore being in a better position because of the increased number of dangerous ‘walkers (both due to to the increase in Tron and the arrival of Nahiri on the competitive scene) would push me to consider some way of employing a 2 Abrupt Decay/2 Maelstrom Pulse/2 Terminate split, and really solidifies Jund as the BGx Midrange deck of choice right now (sorry, Abzan fans). That said, I think you go for 2 Pulse before you reach for the Dreadbores – its power as a catch-all and the potential to be a 2 or even 3-for-1 is too good to disregard. And can we talk about those 2 Grim Lavamancers in the 75? It may not be the newest of innovations (as that card has drifted in and out of Jund decks in the post-Deathrite world), it’s as well-positioned right now as I can ever remember it being. With the big guns being aimed at planswalkers and other threats, someone has to clean up the ground and provide you with some value, and it does that job admirably. Lastly… I don’t know how I feel about Bolt in Tron. It may gain them percentages against the Infect crowd, which I know is a definite area of concern, but I feel that Spellskite in the main also addresses that reasonably well, and Pyroclasm after your opponent goes T1 Noble Hierarch into T2 Blighted Agent is a colossal blowout. Furthermore, the points that you lose against go-wide aggro (the sound you hear is Affinity, Elves, Merfolk, and Gruul Zoo cackling in delight at the lack of early sweepers) makes me think the trade isn’t worth it on balance, at least not in the main. Agree that you gotta go to 2 Pulse before going to 1 Dreadbore. 3 Pulse is too expensive and 1 Pulse/1 DB leaves you in awkward positions elsewhere. Love the Lavamancers. Reid was suggesting them in his CF articles, and I like thinking of them as a kind of Jund Snapcaster of sorts. Two seems a bit excessive with Tron and Jeskai on the rise, but I like one as a bullet. I wonder if it’s worth it in the long-run. My suspicion is no, just because results have been so favorable to Tron sweepers, but I think it’s an interesting metagame call if you know what you’re up against. I also think Bolt isn’t quite as bad against those aggro decks as many claim, at least compared to the sweepers. It can still put in work if you’re following through with other Tron cards. But yeah, sweepers seem better in the average list and the average metagame. I agree Jund is better than Abzan in the current meta but in the BGx vs Jeskai Nahiri matchup I’d still rather be Abzan on the BGx side because Lingering Souls matches up great vs Nahiri. Agree. If the metagae gets more grindy or Jeskai-shifted, Abzan starts to get a lot better. Sadly for Abzan, it lost one of its better incentives when Twin departed the format. High shares of Twin and grindy decks were very hospitable for Abzan and now the major incentive is just grindy strategies. You mention at one point Wild Nacatl surviving Firespout, but it’s in fact killed by it. 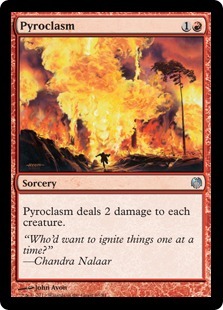 Did you mean Pyroclasm? That was just a typo. Edited! On a second note I have been trying a crazy Jund build myself. I call it 8 Goyf. It uses Moldgraf Scavenger, as well as Tireless Tracker, Sylvan Advocate, and 8 Manlands. Its been more successful than I thought it would be. Very cool. Not a big fan of Tracker (three-drop with its abilities is really not Modern quality), but I could see something like Scavenger shining in the right shell. Always good to try out new options! Good Article. Another consideration in the Dreadbore vs. Maelstrom Pulse argument is Master of Waves. Most current Jund lists are incredibly light on removal for Master and it, together with Kira, Spreading Seas and Silvergill are some of the ways Merfolk decks has a shot vs Jund. Also wanted to hear your thoughts on Pithing Needle sideboard? I play Jund myself and have found it surprisingly flexible. Great additional point, especially with Merfolk on the rise after its huge GP success. DB is not what you want to be doing against Merfolk. 1 Needle seems excellent in the Jund board. I love that card period and wish more people would play it. Jund is a great deck for Needle because it struggles against random haymakers with activated abilities, especially planeswalkers, and because no one boards in artifact removal against Jund anyway. I know! Those evil Needlers. You can often beat it after drawing your whole deck as long as you didn’t expend too much mana before comboing out, but it can be a pain. I like that kind of article! I was wondering if the bolts could also be there because of Nahiri, slows her down and sometimes can kill her? It’s possible this was another consideration, but I think Tron goes after Nahiri with O-Stone, Karn, and Ulamog. But there are boardstates where Bolting her after she fires a -2 at your Wurmcoil or Breaker is the right call, so it might have been a consideration. I think you missed another thing, what about the shift back to a 3/3 Shift in discard from the usual 4/2 split favouring inquisition? That helps get the stuff that decay won’t hit. That was another small adjustment to improve matchups against a variety of decks. But this article was in no way intended to catch all the tiny Jund differences and innovations, even if that’s an interesting topic for another time! I think bolt in Tron is good. What people usually don’t think about is how much time a singel removal will buy you against a deck that relies heavily on one drops and getting to hit with them. Them playing another creatures on t2 and not getting to hit you until t3 is often all you need. Not to mention how unexpected it is to have Tron bolt your infect creatures when you tap out to pump it. It makes it a lot harder to play against Tron when they can interact at instant speed. I don’t play Tron myself but I have a lot of experience with ramp in Modern. There are definitely metagames where Bolt in Tron is where you want to be. Infect-heavy metagames are some of them, and as I said in the article, it also stalls the all-in Inkmoth line in Affinity. But if you’re facing down lots of Gruul Zoo, Elves, and Merfolk (the “go-wide” strategies), it becomes a lot less appealing. Yes I agree. I always liked the mix of Bolt and sweepers. 3/2 depending on the number of flex slots, with more sweepers in the SB. One does not exclude the other I think. Like you’ve said so many times, it’s very hard to correctly predict the meta game at a large event like a GP. So I’d prefer to have both just to ease my mind. But as I said I haven’t actually played with Tron so I can only speculate. Rock on! And props for using those Bolts so early in the season.